My wife and I have operated off of these defaults for years; however, we knew something was up the first time we got coffee from the new “next generation” Dunkin’ store that opened just down the street. I tasted mine and could tell they hadn’t added the standard amount of swirl. What’s more, we were already on the road and didn’t have time to go back to get it fixed. One of the “new concept” Dunkin’ Donuts stores opened down the road from us. The next day we came back for iced coffees. We made our standard order, received our drinks, and didn’t taste them until we were on the road. They’d put in too little swirl again! This experience continued in the months since they’ve opened. I’d gotten in the habit of going in, ordering my coffee, tasting it, and handing it back so they can add more swirl. I knew not to go through the drive-thru. My wife avoided this store altogether. I wondered how many other customers might be doing the same? The problem was there was no quantity next to the flavor swirl. Without the quantity, Hunter was just guessing. It wasn’t that he didn’t know the standard amounts. Instead he didn’t know that the new labels were specifying the standard amount when they listed a swirl without any quantity information. This led me to call over Hunter’s manager to explain what was happening. I showed her my order on my app. It had 3 pumps of swirl specified, but the label didn’t. 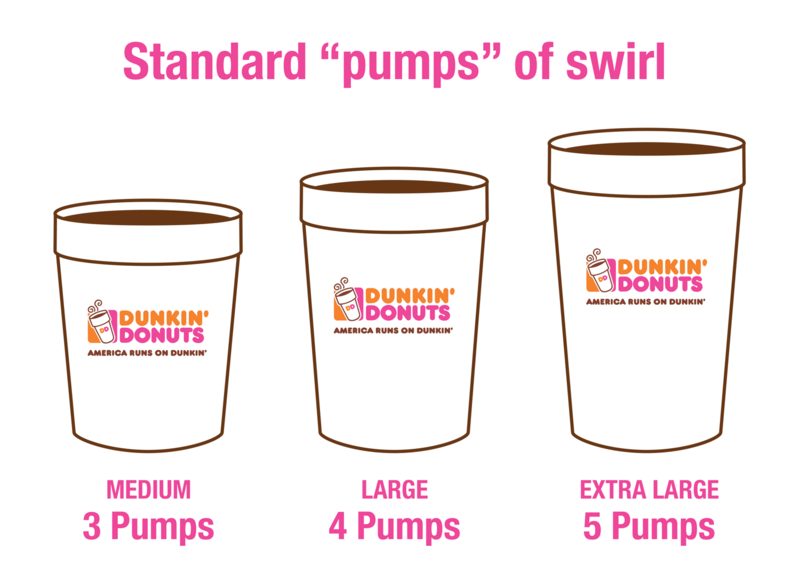 The system was operating off of the assumption that having a swirl for any size drink meant to add the “standard” amount of pumps unless otherwise specified. That confirmed our suspicions. The new labels were indicating flavor swirls based off of the standard amount. She realized then and there that she hadn’t been training her employees on how to properly fill orders based on these new labels. The manager told me she was going to call corporate to let them know about this. The next day I came back to test things out. That store had gotten so many of my orders wrong that I wasn’t sure if my help from the day before would take that quickly. I made my order via the Dunkin’ app while I sat in my car. Then I walked in, and much to my surprise the entire front counter staff (Hunter, the manager from the day before, and someone else I hadn’t met) greeted me by name. 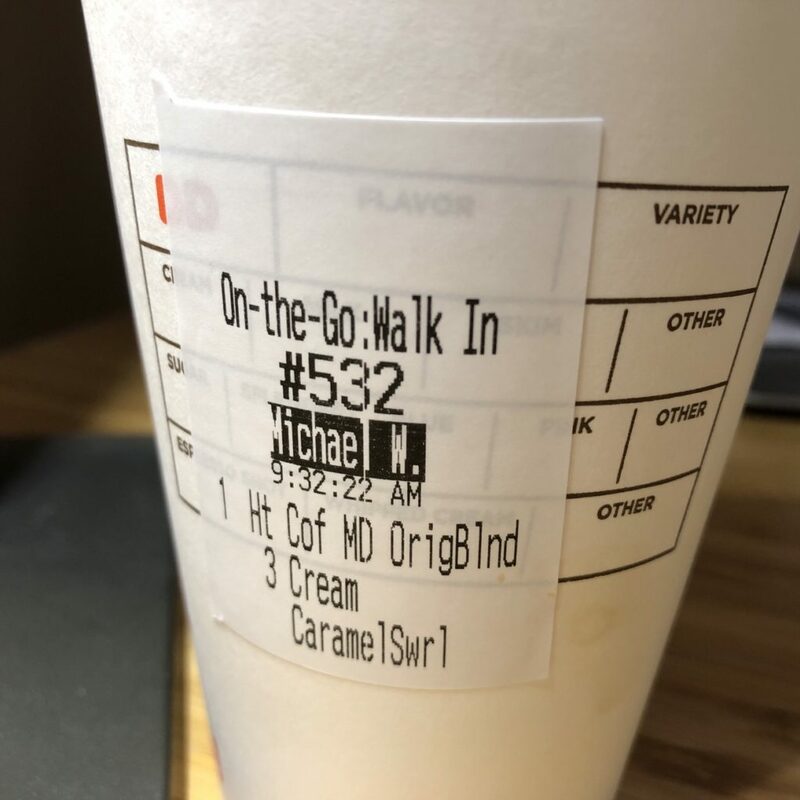 “Michael!” they all said. Apparently the word had gotten out. The manager told me she had called corporate, and based on the help I’d given them, they were going to make sure that all the new stores were trained on how to properly fulfill orders with the new labels. So, the next time you get coffee from a next generation Dunkin’ Donuts with the correct amount of flavor swirl, you just might have me to thank. That must have been a very poorly trained DD if they didn’t know the standard swirl amounts. That’s one of the first things you are taught. I don’t think it was b/c they didn’t know the standard amounts. It seemed to me that the new labels confused them. Once they knew how the labels were specifying the standard amount, they got my order correct. I love you Michael. I absolutely hate driving away with a coffee that doesn’t taste right. Do they still serve shots?